Why to the Czech Republic? The Czech Republic is long-time friendly for the people from the whole world who are willing to accept the local way of living and are not afraid of work. The demographic decrease of the number of population is even leading to the fact the talented foreigners acquire many advantages. In the first place, it will probably be a possibility of university education. After the finished studies, you will find use both in Czech companies who have been passing a progressive development, and subsidiaries of foreign companies who are very open to employ foreigners in our country. 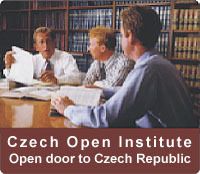 Some professions are lacking in the Czech Republic and therefore you can find an advantageous use there. It concerns e.g. qualified work in the sphere of computer technology and ancillary works in the building industry, the scope of possibilities is wide. Within a short time there is supposed an increase of interest in the middle medical personal. Regardless of the education and profession, you will appreciate order and safety, attractive economic level.. simply speaking, good conditions for you to build up your future in the Czech Republic. Moreover, integration of our country into the European Community will open the whole middle and western Europe for you.